Company benefit schemes have long existed to give employees an extra incentive to be at peak performance whilst at work, whether it is personalised branded pens or health and wellbeing benefits. We recently commissioned a survey of 1,000 UK workers to assess how important the perks of a job are and how companies can make sure they are meeting employees’ needs and expectations. Our findings suggest that company benefits packages are incredibly important to employees. Half of respondents said that they would consider applying for jobs based on the perks offered alone, whilst a quarter of those surveyed admitted they now rate benefits above basic salary. Only 3% of people think that no benefits should be offered as standard. “Offering perks to workers helps attract interest during the recruitment process and retain happy, engaged, committed and quality employees. It is known well within the HR industry that employees often will accept better benefits in lieu of a higher salary which can work out as a saving to the business because it allows businesses to get the tax advantage of deducting plan contributions”. Company perks are significant, not only in recruitment of staff, but in retainment too. One third of respondents to our survey would leave their job if benefits were not updated and reviewed regularly, whilst 43% stated they would leave their employment if benefits were stopped. This data highlights how important it is for businesses to focus on providing a great benefits package. We know how expensive this can be, so we’ve put together some guidance on how to make sure you are spending your money wisely. 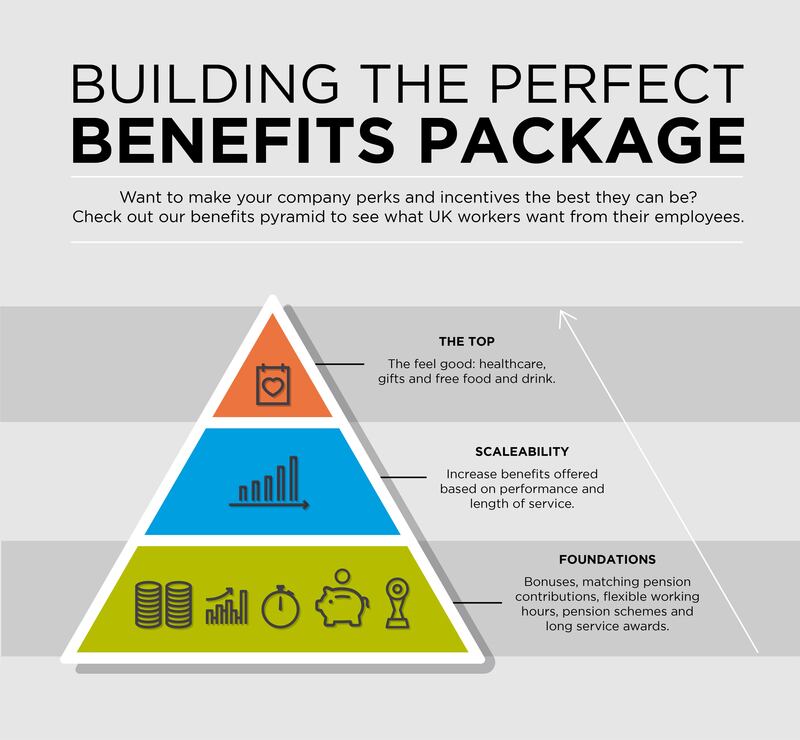 If you consider the benefits package your company has on offer as a pyramid, these five perks make up the base and foundations of that pyramid. Many companies already offer these as standard and our data suggests they are now expected by employees. It would be sensible, if you don’t already, to introduce these benefits for all your employees. Respondents to our survey selected the five perks above as the ones they would most like to see increase over the time they work for a company. Reward staff who stay loyal to your company by increasing the employer contribution made to their pension or giving more extensive flex-time allowances. Consider these benefits as the second level of your pyramid. Creating easily scalable and adjustable benefits in this way not only rewards loyalty and long service but allows companies to easily monitor and review the perks on offer to their staff. The more proactive you are with updating employee benefits, the happier staff will be and the longer they’ll stay with you. Sitting at the top of your benefits package pyramid should be the smaller perks that really help to brighten your employees’ experience. Think of it like the cherry on the cake. There are a wide range of benefits that businesses could offer under this umbrella that can help to make a difference to who wants to work for you, and who is likely to stay with your company. One area that it is important to look at here is healthcare. Around one in five respondents identified mental health counselling, eye care and dental care as attractive standard perks. Investing in healthcare perks will not only help attract and retain staff, but will give you a healthy, happy workforce. One of the largest causes of sick days in the UK is stress and mental health problems, so investing in counselling will not only make your employees feel more supported, it will help limit the amount of working days lost throughout the year. Free food and drink also seems to be a big draw for employees. 29% said they would like to see this as a standard perk and it could achieved by something as simple as providing tea and coffee facilities in the office. Gifts from employers also go down well with staff. Small gestures like these really make your workforce feel appreciated, encouraging them to perform at their best for your company. Great practical and desirable gifts can be designed to bear your company logo, meaning your staff promote your business wherever they go. One of the most significant pieces of data drawn from our survey is that 64% of people would find a job more appealing if it had a customisable benefits package. Allowing employees to customise their own benefit packages gives them a feeling of freedom and trust, which could also be advantageous to your business. This flexibility is particularly important in an increasingly multi-generational workplace. For example, only 21% of 18-34 year olds believe that pension schemes should be offered as a standard perk, compared to 71% of over 50s. There is also a slight lean amongst women to favour healthcare perks in their standard packages, whereas men prefer additional financial incentives such as profit sharing. By avoiding a one size fits all benefits package, companies can make jobs more attractive to potential employees. 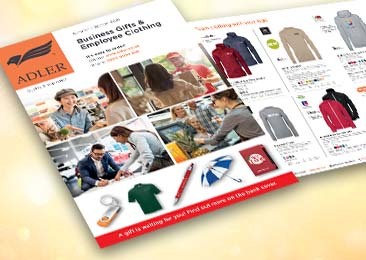 Providing opt-out options on some benefits that an individual will not use, and allowing a re-distribution of those perks elsewhere, is more effective spending on the part of the employer and will prevent paying out for unused perks. As younger generations move up through the work place, perks and incentives look set to become evermore important to businesses if they wish to recruit and retain the best staff. 40% of 18-34 year olds state that their benefits package is more important to them than basic salary, compared to just 6% of over 55s. To ensure you stay on top of employee expectations and desires moving forward, review your current offer with staff to see where it can be improved. 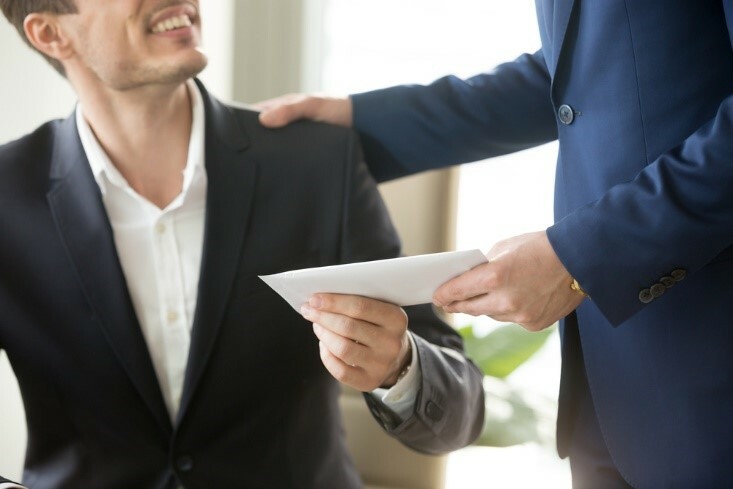 Be prepared to place more importance on benefits offers in the coming years as these become of greater concern to your employees.